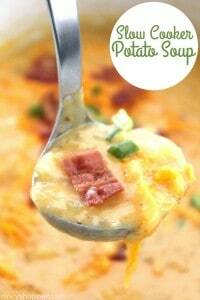 This Slow Cooker Potato Soup loaded with cheese and topped with bacon makes for a perfect winter meal. 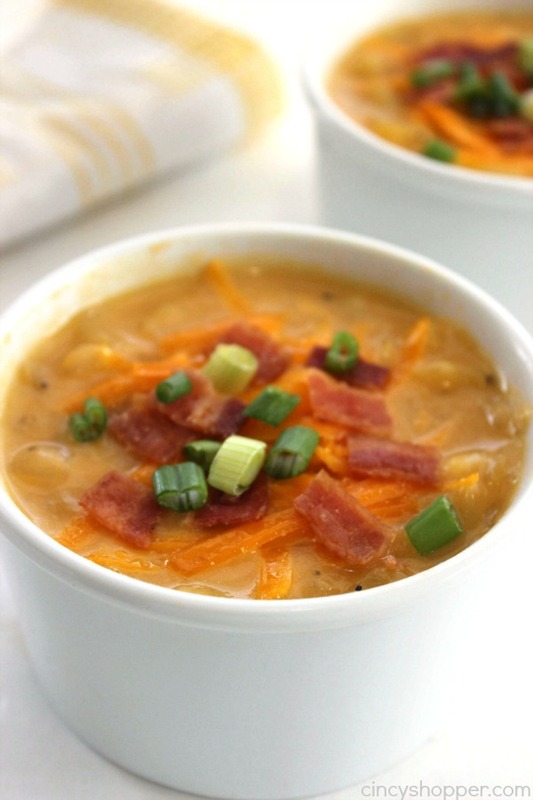 This cheesy soup is super simple and cooks all day right in your Crock-Pot. Load on some extra cheese and green onions to really kick it to another yummy level. 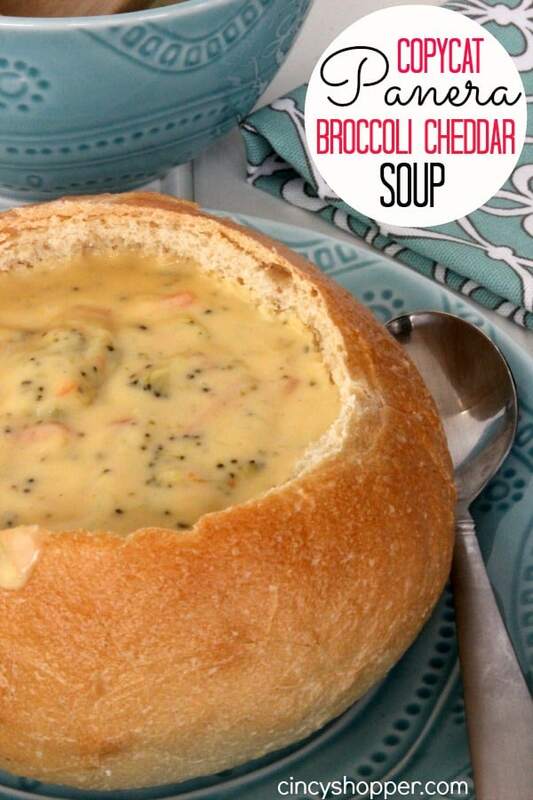 During the cold winter months, there is nothing better than a hot cup of soup and sandwich for dinner. My daughter and I are addicted to a certain store brand potato soup that is super expensive and only feeds the two of us. I will splurge and buy us a container to split quite often. 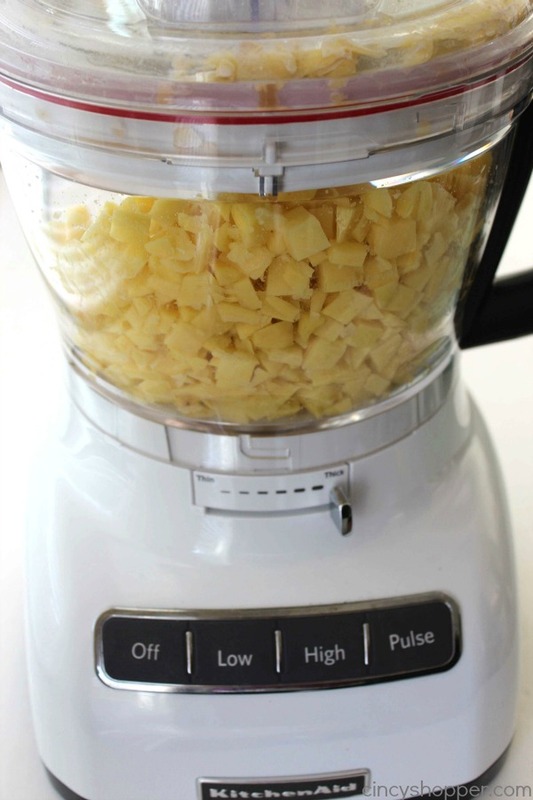 I splurged a bit on myself over the holiday season and bought the KitchenAid Food Processor with the dicing attachment. 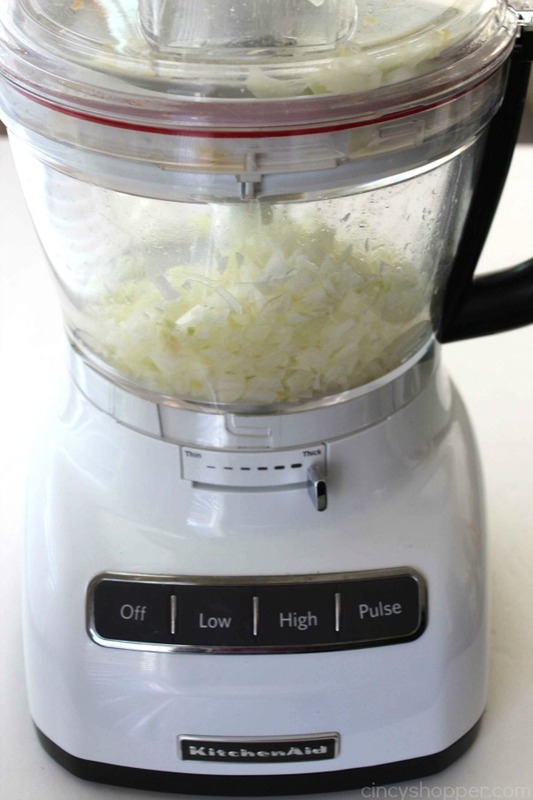 So, I quickly diced my potatoes and lots of onion in my new kitchen gadget. Wow, I love that thing! 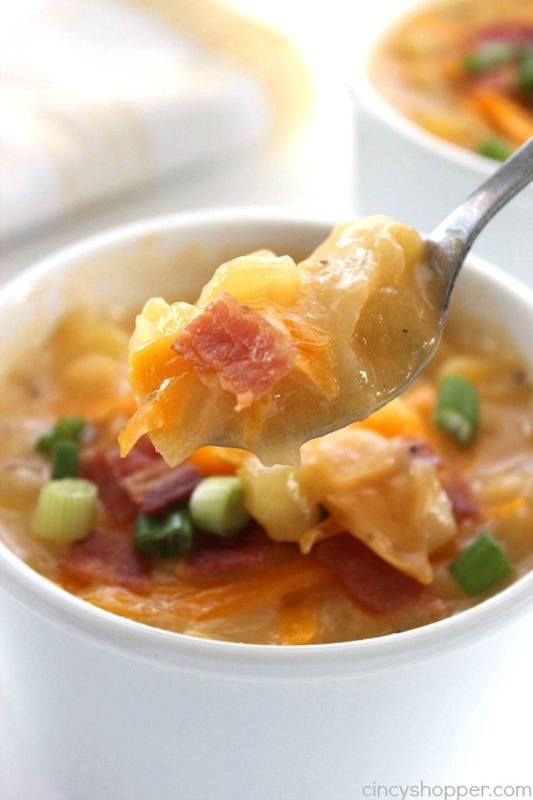 The great thing about this cheesy potato soup is that you can cook it on low for 8 hours or cook on high for about 4.5 hours. 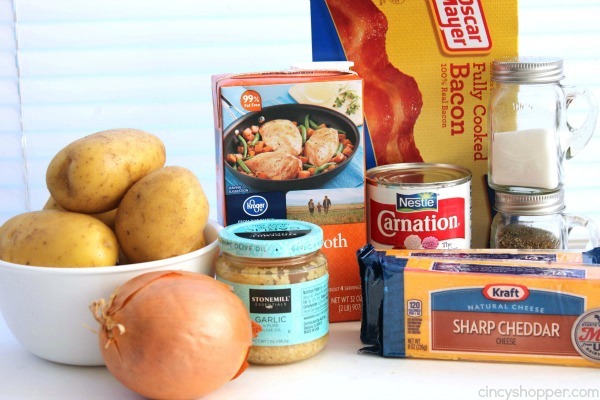 I tossed my couple ingredients in the slow cooker and headed on a few errands. 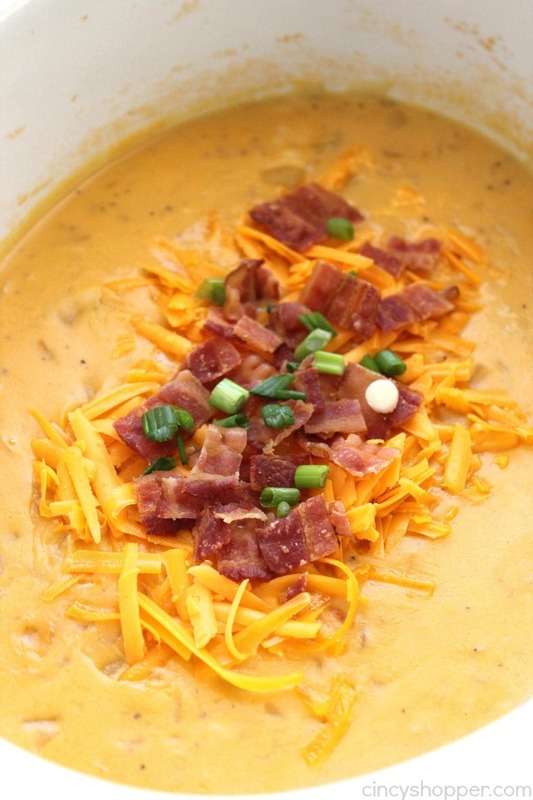 I used a sharp cheddar cheese in our soup because it always cuts back on the extra grease that you sometimes get from a mild cheddar. 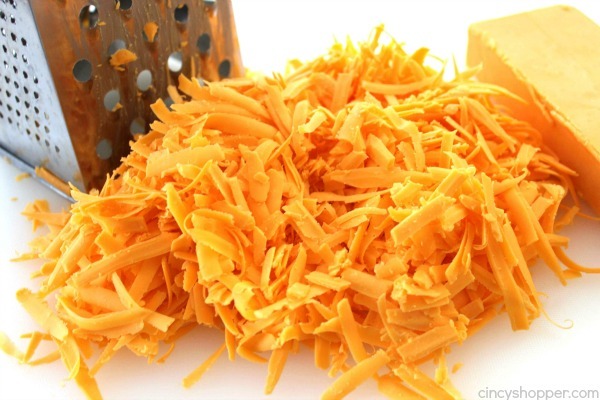 I am sure a mild cheddar would work great as well. Potato soup is never complete for me without the addition of bacon. I made some quick and easy pre-cooked bacon that I had on hand as well as some added flavor from the green onions. 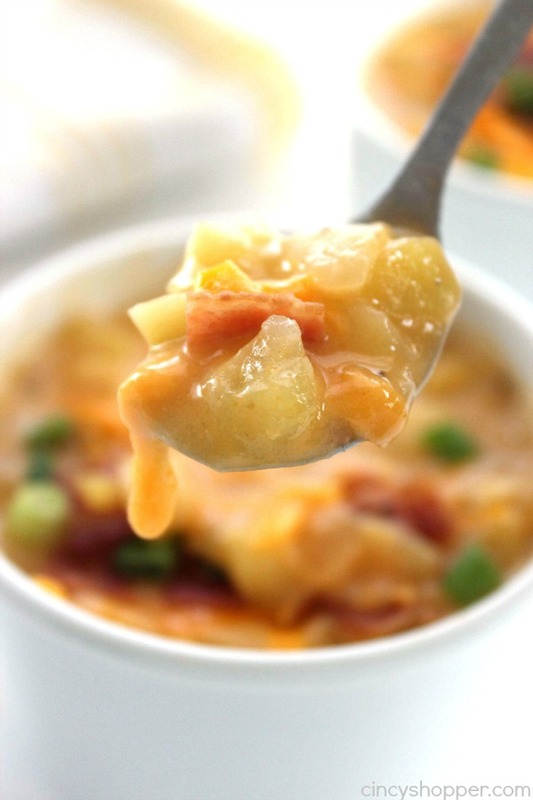 To make this easy Crock-Pot soup you will need potatoes, chicken broth (vegetable could work too), cheese, evaporated milk, onion, garlic, cornstarch, salt, and pepper. 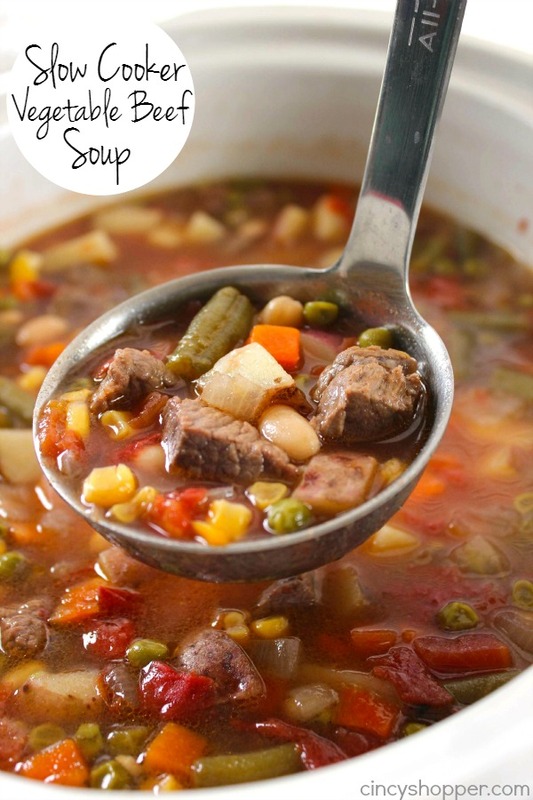 You can have this soup cooking in no time. 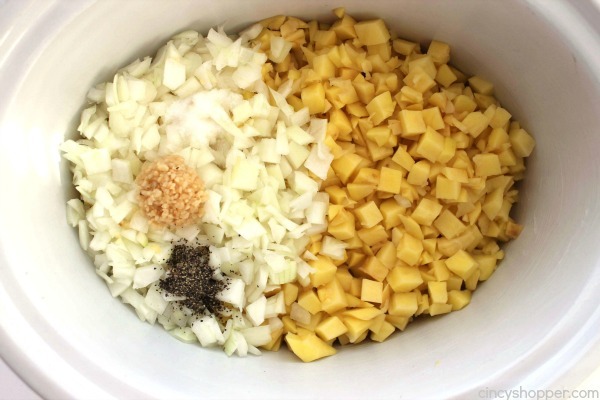 Add onions, garlic, potatoes and broth to slow cooker. 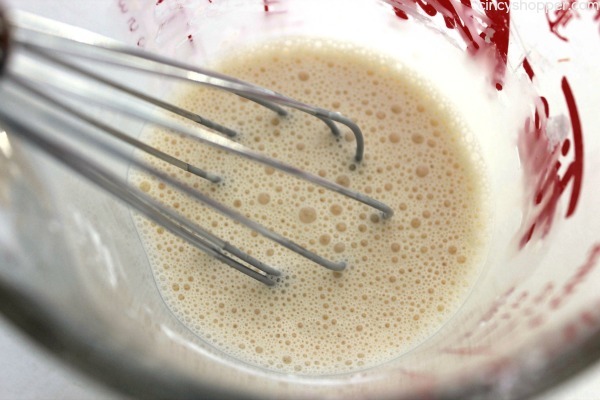 Whisk together cornstarch and evaporated milk until smooth. 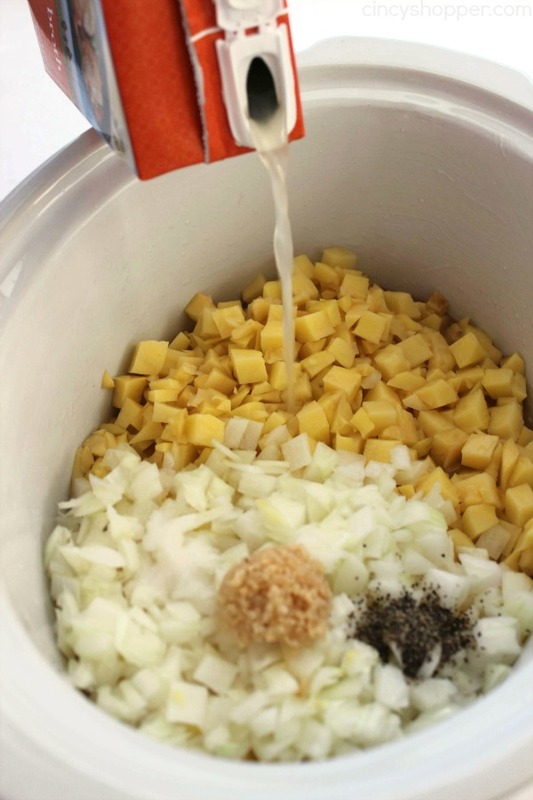 Stir cornstarch mixture into slow cooker until blended. 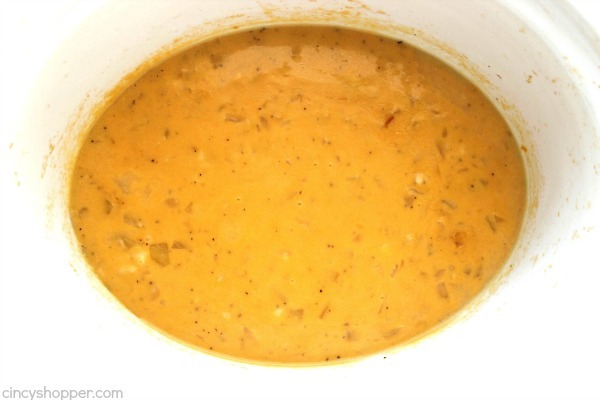 Stir in cheese until well melted. 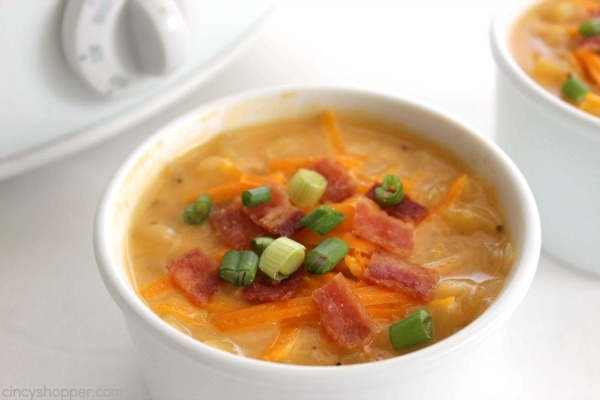 Do you have a favorite Slow Cooker Soup recipe that you make frequently? 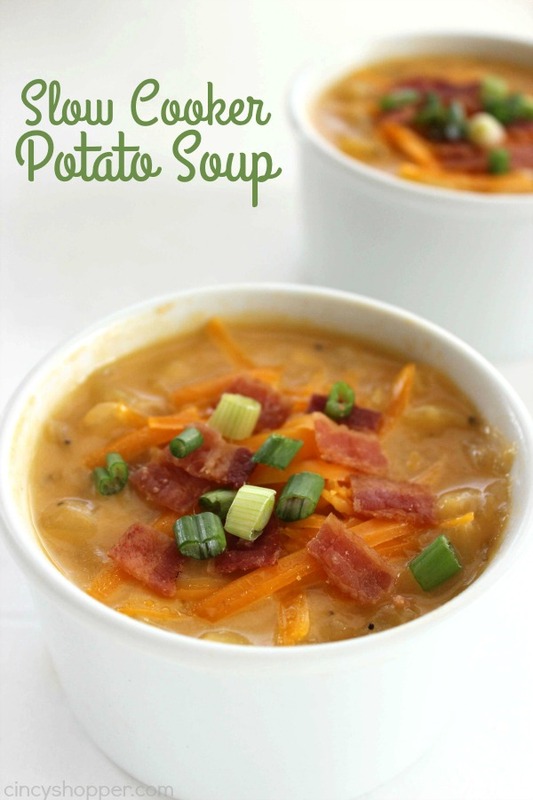 Two things I love, ok three: potatoes, slow cookers and soup. Thanks for sharing at the Monday Funday Link Party. Emily @ The Benson Street. 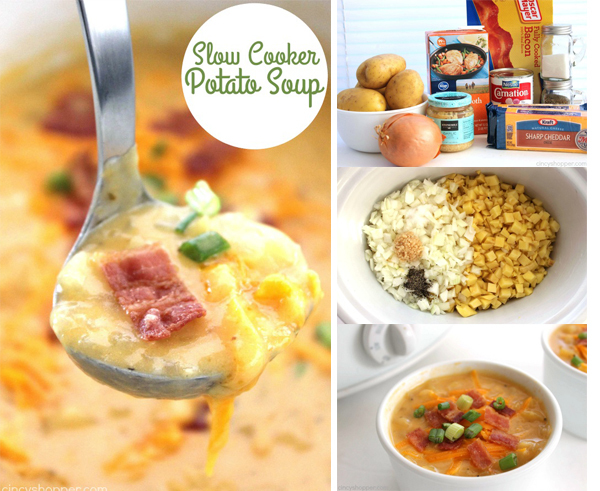 So, technically it’s not quite cool enough where I live for Crockpot soup recipes, but I don’t care. 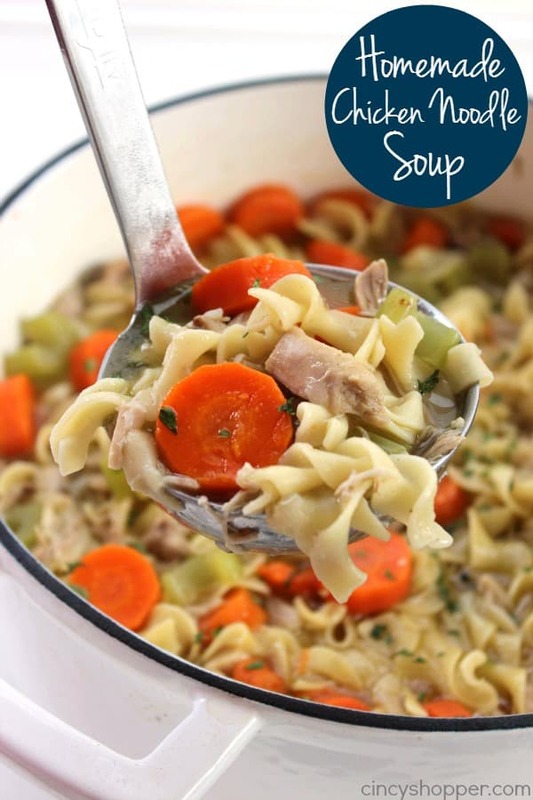 I’m going to say “to heck” with those silly traditions and put my Crockpot to use today for this luscious sounding recipe. Thank you so much for sharing your talents with us!